Itema040116c - Mythological creatures, Sproat Island, petroglyph reproduction, Centennial Museum, Nanaimo, B.C. Itema040117c - Georgia Park, Nanaimo, B.C. Itema040118c - Bear totem carved by Henry Hunt, Kelsey Bay, B.C. Itema040119c - Stone grave post, Metlakatla Island, B.C. Itema040120c - "Man who fell through a hole in the sky", petroglyph on mainland near Prince Rupert, B.C. Itema040121c - Top of eagle chief's pole of Tanu (original), Fulton Street Park, Prince Rupert, B.C. Itema040122c - Eagle chief's pole of Tanu (original), Fulton Street Park, Prince Rupert, B.C. Itema040123c - K'nu Canoe Point, Venn Passage, P. Rupert harbor, archeological site, back ridge above second house terrace, Mainland, B.C. Itema040124c - K'nu Canoe Point, Venn Passage, P. Rupert harbor, archeological site, posts in situ, toward North Mainland, B.C. 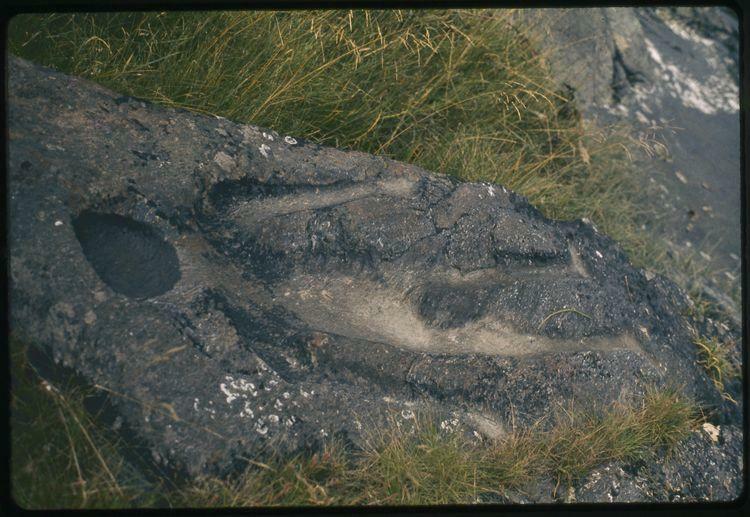 Item a040120c - "Man who fell through a hole in the sky", petroglyph on mainland near Prince Rupert, B.C.